It’s been another outstanding year for Florida State University, and I want to thank all of you for the important role you’ve played in our success. 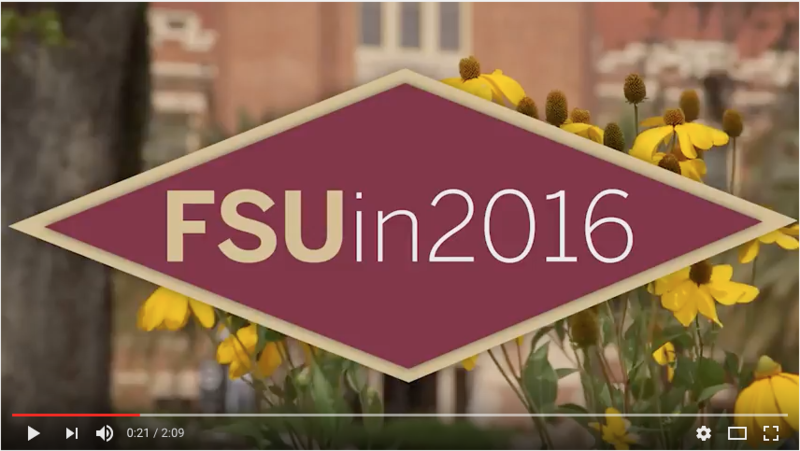 Our accomplishments in 2016 have set FSU on a path to greater national prominence, and I was pleased to have the opportunity to talk about these achievements and outline our goals for the future in my recent State of the University address. It was wonderful to see so many of you there! If you were not able to attend, you can view the webcast here. We can all be proud of the work we have already done, and as we look forward to 2017, there is a lot more to do! We will implement our five-year strategic plan, focus on improving metrics that are key to performance and preeminence funding and national rankings, recruit and retain top faculty and staff, expand our research enterprise and continue to build on our diversity and inclusion efforts. We are already preparing for the legislative session in March, and we are asking for significant funding to help us improve our faculty-student ratio and grow our graduate student enrollment. I am optimistic that we will have support in reaching these goals. 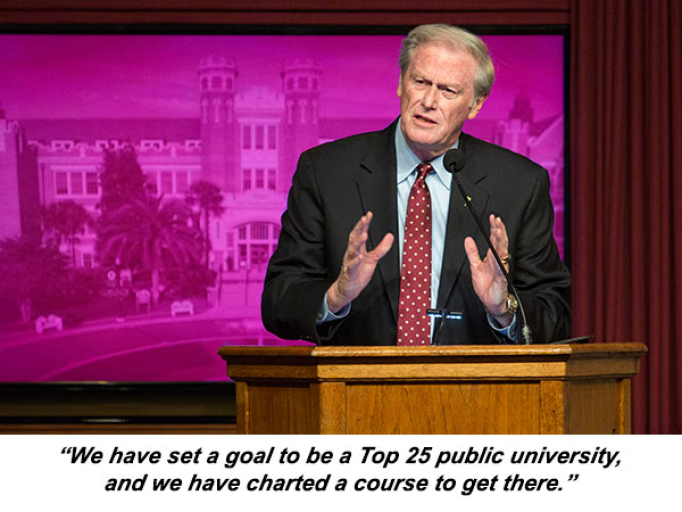 We have charted a course to become a Top 25 public university, and I know our collective passion for Florida State will help us get there. It’s not just about the rankings, though. As I mentioned in my State of the University address, it’s hard to put a number on what we do, especially at a student-centered university like Florida State. Your enthusiasm inspires our students, academically and outside of the classroom. 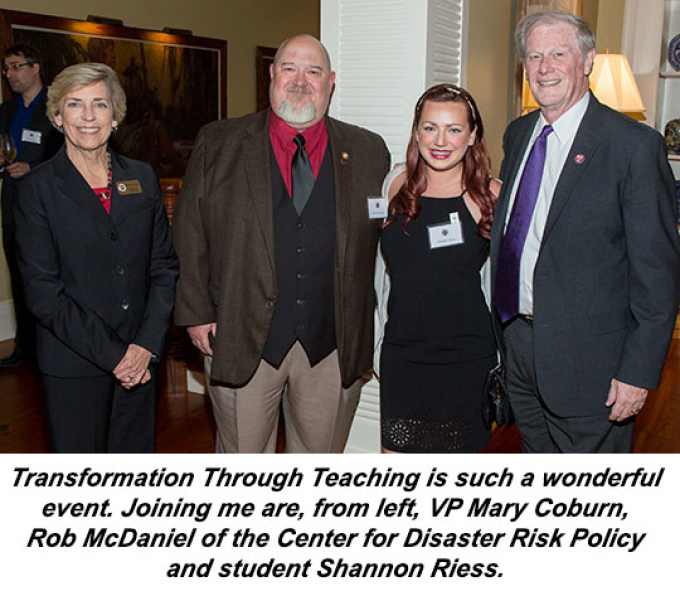 I was reminded of your dedication to helping students at the Transformation Through Teaching dinner at the President’s House on Nov. 28. I applaud the faculty who were recognized — and all of you — for the difference you make in the lives of students on a daily basis. That’s why when I spoke to lobbyists at the national Higher Education Government Relations Conference last month in St. Petersburg, I talked about the misconceptions in statehouses across the country about what exactly goes on at our universities. I will continue to work hard to make sure legislators and other public officials know how much you do and how invested you are in our students' success. It’s time to close the gap between perception and reality. Of course, we all know we couldn’t do any of this without the incredible support of our alumni and friends. 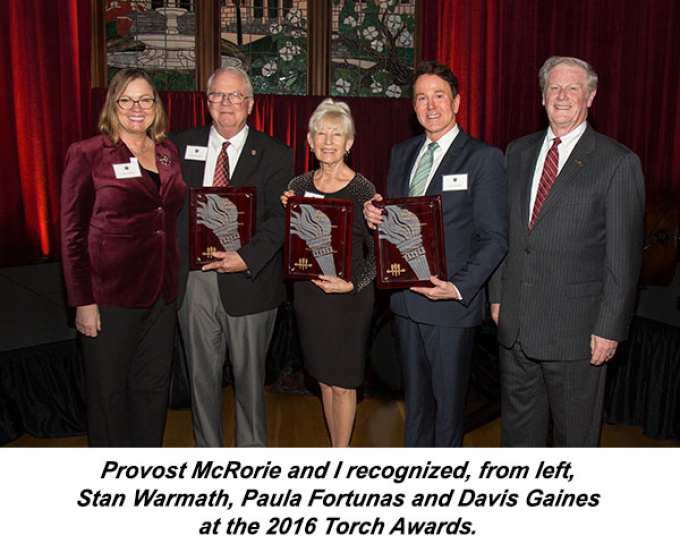 It’s great that the Faculty Senate recognizes that support every year with the Torch Awards. It was a pleasure to honor Broadway star Davis Gaines, retired TMH Foundation CEO Paula Fortunas and retired psychology department facilities manager Stan Warmath for their contributions to the university’s academic excellence. I know the good news about Florida State is spreading far and wide. When I traveled to Houston for a special event for FSU friends and donors in November, many of the guests commented on how they are hearing a lot more about FSU than in the past, thanks to our elevated academic reputation and our enhanced communications efforts! As we wrap up the semester, I’m really looking forward to Commencement ceremonies this weekend. It’s an honor to have two accomplished members of the FSU family as our Commencement speakers — Joe Schlenoff, this year’s Robert O. Lawton Distinguished Professor, and Bob Sasser, CEO of Dollar Tree Inc. and a member of our Board of Trustees. If you can’t be there in person, you can check out the webcast. Please continue to share your ideas and feedback with me. I also love hearing about your research and creative activities and seeing the headlines you are generating around the world! Below are a few that caught my eye. Have a safe and relaxing winter break! I look forward to seeing you in 2017.